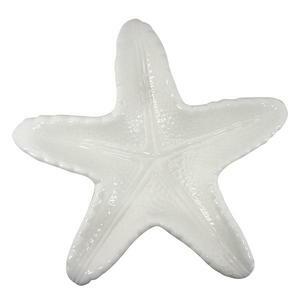 FYI: ALL WHITE STARFISH HAVE BEEN BLEACHED AND ARE USUALLY OFF WHITE IN COLOR. 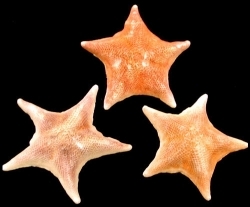 (WILL SHOW A SLIGHT TANISH COLOR). 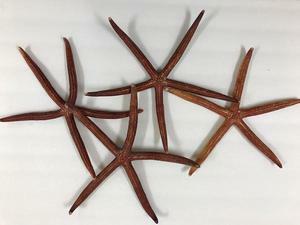 HOW TO GET STARFISH SIZES - MEASURE FROM TOP LEFT ARM TO BOTTOM RIGHT ARM. APPROX. 6 TO 8 INCHES..... (NOTE! 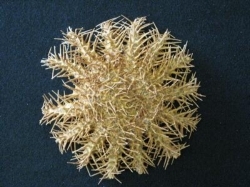 MANY THORNS ARE USUALLY FLAT WHEN RECEIVED FROM SUPPLIERS). 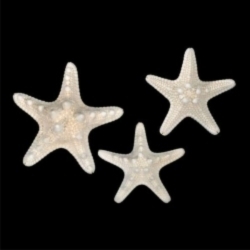 FROM - AUSTRALIA GREAT BARRIER REEF. APPROX. .75 TO 1 INCH....... 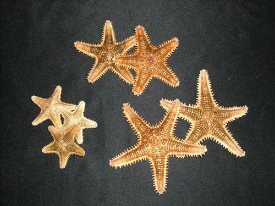 RECEIVE (1) STARFISH PER NUMBER ORDERED. APPROX. 5 TO 6 INCHES....... 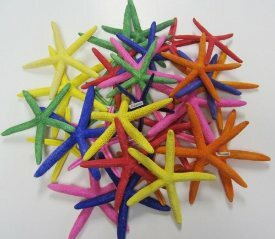 RECEIVE (1) STARFISH PER NUMBER ORDERED...... ASSORTED COLORS WILL SHIP PER NUMBER ORDERED. 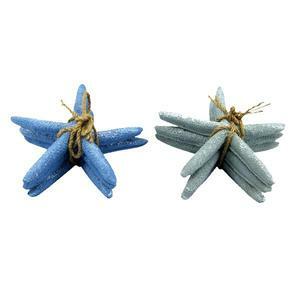 FYI: IF USED FOR CHRISTMAS ORNAMENTS YOU WILL NEED TO ATTACH A STRING FOR HANGING. 4 TO� 5� 7/8 INCHES. 3 TO 4 INCHES.... (PENTASTER OBTUSATUS). 6 TO 7 INCHES.... (PENTASTER OBTUSATUS). 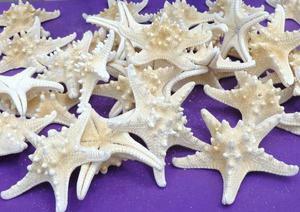 FYI:��MOST WHITE STARFISH HAVE BEEN BLEACHED AND ARE USUALLY OFF WHITE IN COLOR.� (MAY SHOW A SLIGHT TANISH COLOR). 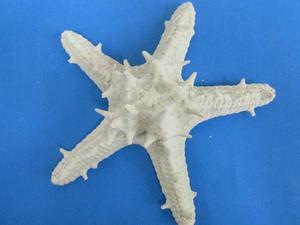 2� TO 3 INCHES...... (ALSO CALLED - ARMORED STARFISH). 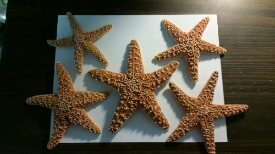 12 TO 15 INCHES.......(NOT ALL STARFISH WILL HAVE PINK TIPS). 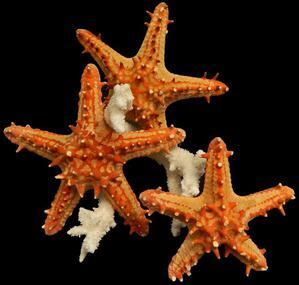 (AT TIMES A FEW SPINES MIGHT BE MISSING FROM THIS STARFISH). APPROX. 9 TO 10 INCHES. APPROX. 2 TO 3.75 INCHES..... 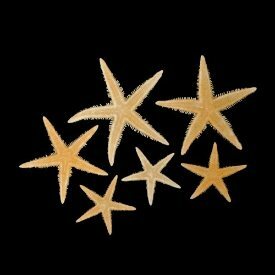 RECEIVE (1) STARFISH PER NUMBER ORDERED.... (NOT ALL ARMS MAY BE PERFECT). APPROX. 5 TO 7 INCHES. 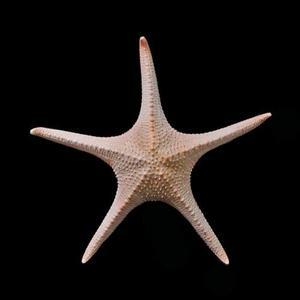 4 TO 6 INCHES...... ALSO CALLED: MULTI-LEG STARFISH..... (BECAUSE THIS IS A NATURAL STARFISH NOT ALL ARMS WILL ALWAYS BE PERFECT). 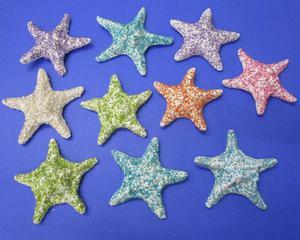 4�TO�6 INCHES.....� RECEIVE (1) DYED STARFISH PER NUMBER ORDERED. (SMALL SIZE)......�� 2 TO 3 INCHES. APPROX. 6 TO 7 INCHES...... 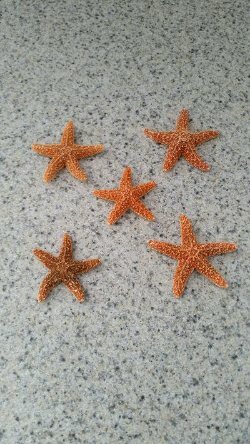 RECEIVE (1) STARFISH PER NUMBER ORDERED. APPROX.� 12 TO 15 INCHES....... (LEIASTER LEACHI). 8 TO 9� 7/8� INCHES. 10 X 10 X 2 INCHES...... 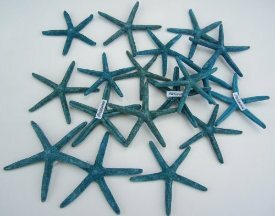 RECEIVE (1) STARFISH PER NUMBER ORDERED. 1 WHITE, 0 BLUE, 0 TEAL LEFT. 8 INCHES.... 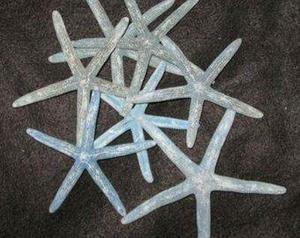 RECEIVE A BUNDLE OF (6) RESIN STARFISH PER NUMBER ORDERED. 10.25 INCHES....... 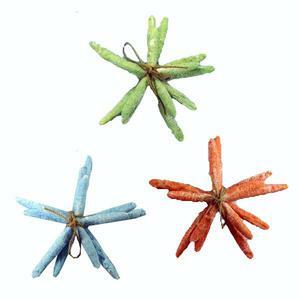 AVAILABLE IN: BLUE, GREEN OR ORANGE. (PLEASE USE DROP DOWN MENU TO CHOOSE COLOR). 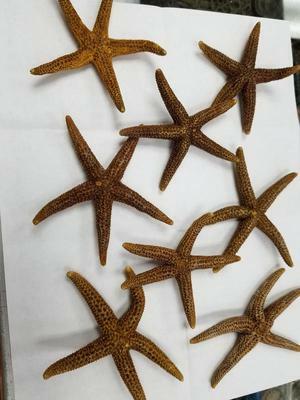 5 INCHES......� RECEIVE A SET OF (3) STARFISH PER NUMBER ORDERED. 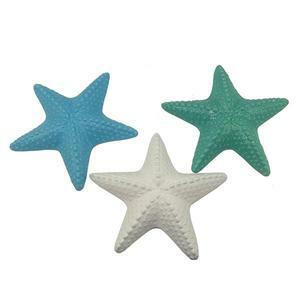 (PLEASE USE DROP DOWN MENU TO CHOOSE COLOR OF STARFISH). 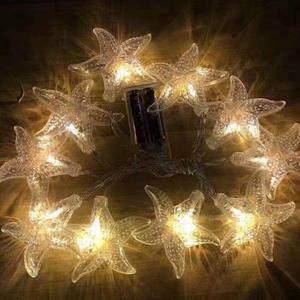 APPROX.� 65 INCHES LONG.��STARFISH MADE OUT OF PLASTIC.��SET HAS (10) LED LIGHTS. REQUIRES 2 AA BATTERIES (NOT INCLUDED). PACKAGED IN A PVC BOX. 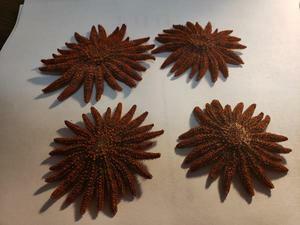 12 X 12 X 2.75 INCHES. 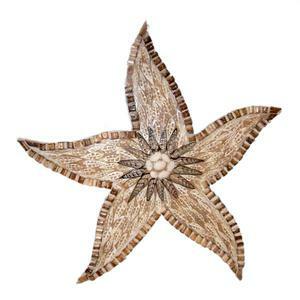 ALL STARFISH ARE FOR CRAFT OR DECOR USE ONLY. NOT FOR USE IN FISH TANKS OR TO GET WET. 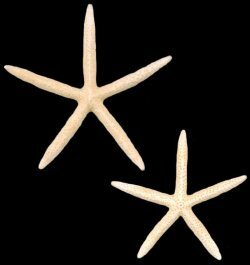 PLEASE REMEMBER THAT THE STARFISH WERE ONCE LIVE. THEY WILL NORMALLY HAVE A "FISHY" SMELL TO THEM FOR SEVERAL DAYS ONCE TAKEN FROM THE DELIVERY BOX. 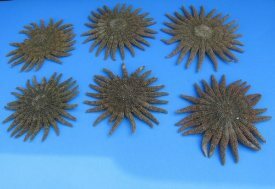 PLEASE ALLOW THEM TO "AIR OUT" IN A COOL PLACE. (NOT IN THE SUN. THIS COOKS THEM). THE SMELL TENDS TO LEAVE AFTER ABOUT A WEEK. 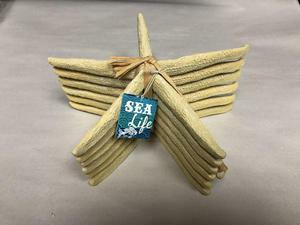 (REMOVE FROM BOX, AND PLACE IN A OPEN AREA). 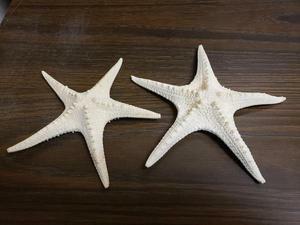 ALSO, THEY HAVE BEEN TREATED TO USE AS A DECOR PIECE. 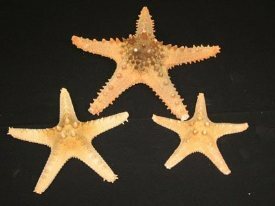 PLEASE KEEP ALL STARFISH OUT OF WATER. THIS WILL REMOVE THE PRESERVE AND ROT THEM.